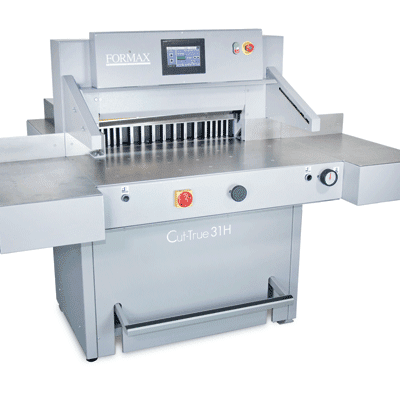 The Formax Cut-True 31H Hydraulic Guillotine Paper Cutter features a hydraulic blade and clamp drive for true two-shift operation, and rugged heavy-duty construction for precision cutting of paper stacks up to 28” wide and up to 4” high. User-friendly features include a color touchscreen control panel, automatically-adjusting back gauge, an internal light to illuminate the cutting area, and the capacity to program up to 100 jobs/100 cuts. Operation is simple using the color touchscreen for programming and selecting jobs. The foot-pedal pre-clamp and bright LED Cutting Line work together allowing operators to see exactly where the blade will cut and to make fine adjustments. Electronically-controlled two-hand operation engages the hardened steel blade for crisp, accurate cuts, every time. Cutting accuracy is 0.1mm on maximum paper stacks. Key Features7" Color Touchscreen. Hydraulically controlled. Low-friction air-assist ball deck. Cuts stacks up to 28" wide. LED cutting line. Infrared Safety Curtain. Up to 100 programmable jobs. Extra large side tables.